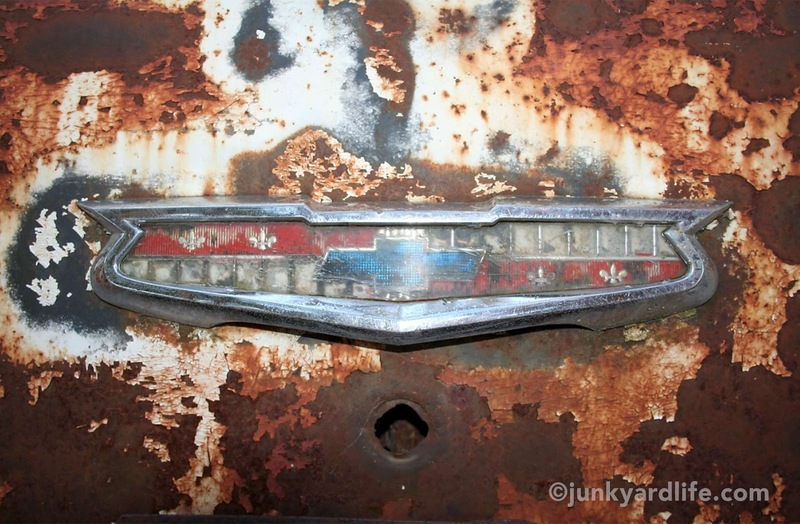 Welcome to Junkyard Life’s Mystery Theater. 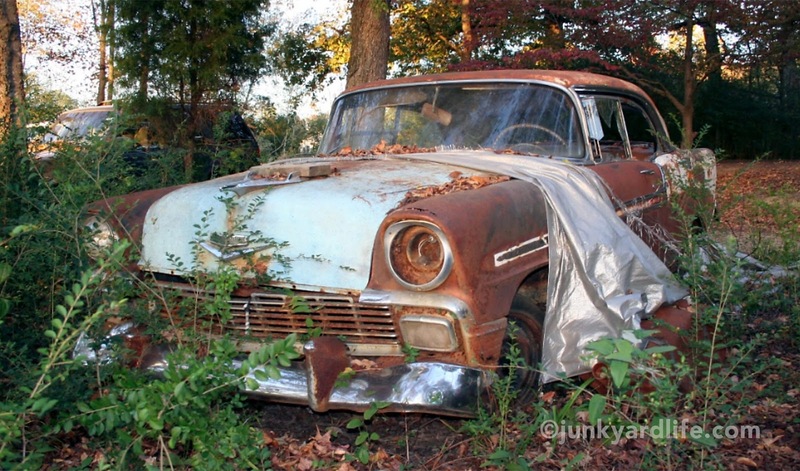 Tonight’s Rust Opera shall begin with a mystery car — one 1956 Chevrolet Bel Air that we stumbled upon. “What makes this a mystery?” you may ask yourself or the Rust Opera attendee seated to your right? That is weird that in a theater you are more likely to speak to someone you don’t know seated on your right. Silence! 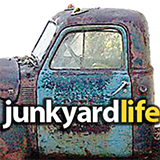 Your Junkyard Life Mystery Theater Host Jody, Keith and Ron are about to tell you. There were many 1956 Chevrolets sold. That is no mystery. This handsome fellow represents a mere shadow of the man he used to be. Behold, opera fans… this one is a two-tone, four-door Bel Air hard top. Likely the most expensive car on the dealer lot. Second only to the Nomad wagon and the new kid on the block, Corvette, then in only its third year of production. This example was missing a few pieces lost in the hands of time, but otherwise a rather complete car. Four-door hard tops are very cool. So, where is the mystery? This Bel Air was equipped with an AM radio (now missing) and all the proper Bel Air trim. Notice the Bel Air emblem is hiding a speaker and a well-placed clock? Notice anything weird, Junkyard Life Mystery fans? Look carefully. 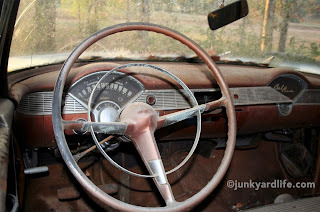 It seems upon close examination that this ’56 Chevy was somehow equipped with an automatic transmission indicated on the instrument cluster AND also a manual transmission indicated by the three pedals which appear to be of factory issue. Explain! 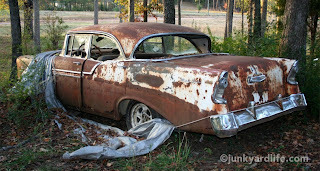 The four-door hard top is a beauty despite rust. The remaining stainless trim has withstood the test of time plus the hard top gives the 4-door a sporty profile. What's inside intrigues us most. With that three-speed and a Power Glide, does that make it a five-speed? Drop us a comment below. We have a theory about this transmission madness but we want your input. 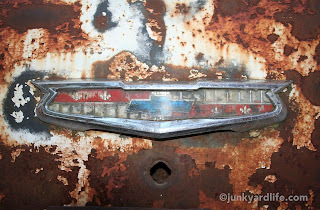 Goodnight for now, Rust Opera Junkyard Life Mystery Theater and shoebox Chevy fans. We leave you to wonder which came first. While you are wondering, also imagine the bright contrast that the red or orange dash (Sierra Gold?) had with the two-tone paint. For that matter, what color was it actually? We love the hidden fuel doors on the 1956 models. Actually, the entire car has a presence and a prestige all of its own. These cars are still around and if you have the resources to rescue, please do! 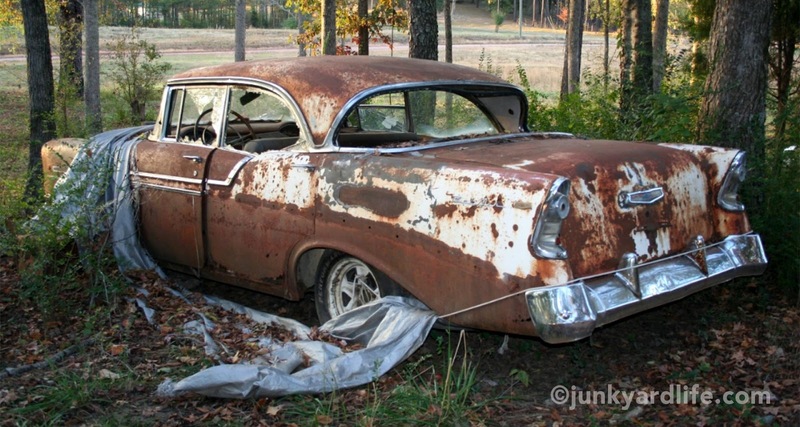 A total of 103,602 Chevy Bel Air 4-door hard tops were built in 1956. That accounts for just 6% of the 1.6 million Chevy passenger vehicles built for 1956 model year. How many do you see today?